The corpse flower “Charlotte,” is in peak bloom right now at the United States Botanic Garden in Washington, D.C. and it’s causing quite a stink. The Corpse flower or “Amorphophallus Titanum” is known as one of the world’s most majestic tropical plants. It only blooms once every four to five years and is said to smell about as good as it sounds. While it smells terrible to us, it smells great to flies which attracts them to lay eggs and help pollinate the plant. Once opened, the blooms of these plants last but a couple of days before they crumble and it takes between two and seven years for its bulb to gather enough strength to flower again. Fortunately with the live video cam, we are able to see “Charlotte” in peak bloom without having to take in the stinky odors. Want to learn more about this rare tropical plant? 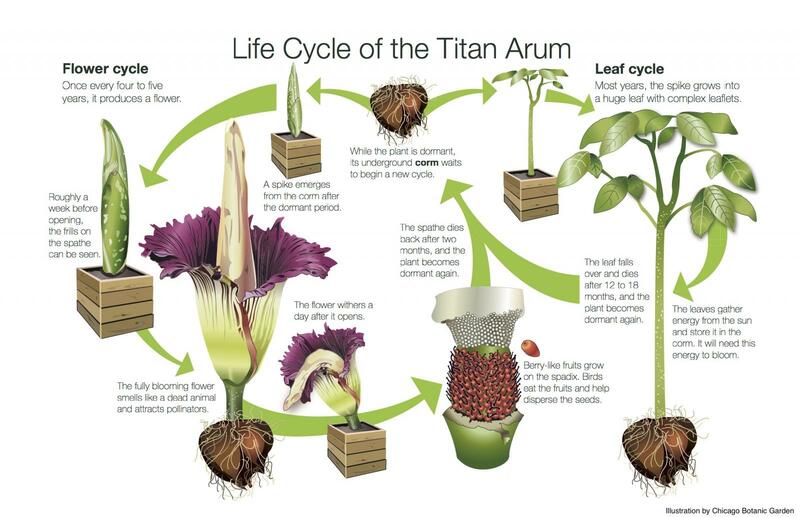 Click here to see the Corpse Flower lifecycle.